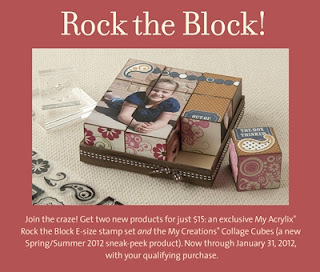 Create with Traci: In December you can ROCK THE BLOCK! 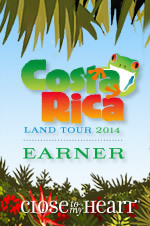 Edited 12/20 to add deep urls for links. When the new Spring/Summer catalog goes live February 1st- the stamp set will NOT be in there... it is strictly available with the Rock the Block special till Jan. 31st. The My Creations blocks will retail for $14.95 all by their lonesome! So... myself and over 30 other consultants are here to show you why you NEED this set! If you've come from Kathleen's blog- you are headed in the right direction.. if not- no worries- click the link at the bottom of this post to visit the next stop on the hop and you should circle clear around the hop. So... after all of that rambling- here's what you care about... photos! **I designed these projects to display at an upcoming bridal show in mid-January. I wish I was still this skinny! LOL... 9.5 years and 2 kids later.... ahhhh. I used the Cricit Art Philosophy cartridge to cut my roses... LOVE that cartridge. I decided to use my blocks for a "countdown calendar" It's generic enough to use for birthdays, holidays and any other special occassion you just can't wait for. 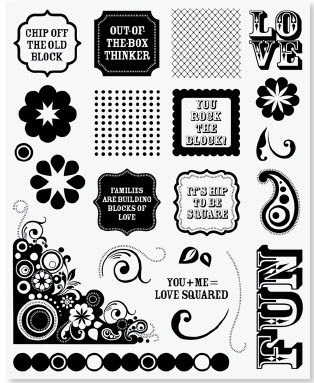 The diamond and polka dot paper patterns are stamped with stamps from the exclusive stamp set that comes with the Rock The Block promotion. The set comes with 9 blocks in all. Because the blocks only have 6 sides... I used the last two to stamp 7,8,9 and 0. You can see some blank sides... I am still finishing them up but check out the last photo. I will be using "LOVE" "families are building blocks of love", and You +Me= Love Squared. to finish off the last two blocks. The letters and numbers were also cut using the Art Philosophy cartridge. I didn't add any embellishments... which was really hard... but they need to lay flat and that way they have extended use beyond just one "countdown event"
I hope you'll join me in hopping around to check out the other projects... I am really excited to see what others have done with this set. Head over to Georgia's blog to see the next idea posted! In the meantime... if you see something you'd like to order- send me an e-mail or order from my website. Either way- you won't be sorry! Gorgeous. Great job and great idea! I love both projects, the tray photo frame and the calendar -- AWESOME! Beautiful job on both photos and I love how your "out of the box" idea for the cubes. Love the layouts and the ideas, thanks for sharing. very cute, love the ideas here! Great projects! love that frame! Darling projects! I love how you used the block box. (say that 3 times fast). I also love the countdown the days calendar! After seeing how you used Roxie on this project, I like it a lot more than I did before! Now I have an idea for my sister's birthday next year! Fantastic job! Great idea for the blocks and what a beautiful tray! What a lovely use of this cool set!